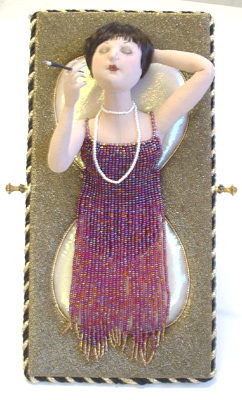 Medium:... doesuede over an armature, the 1920's dress is handbeaded. The pattern is original (with a little help from various dollmakers along the way), one of a kind. The face pattern was the same for both heads - the variation is just in the simple needlesculpting. The completed stand with doll is 14" high. 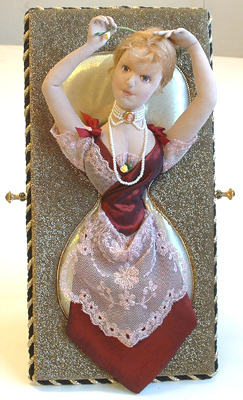 Description: This topsy-turvy doll is all in one, inserted into an hourglass cutout. Inspirations:Since the Challenge topic was "Challenges in Time", the idea of going from the start of one era to another was appealing, I considered the Thirties look, but thought the Twenties might be easier. 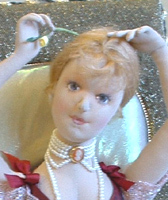 The doll has gone through many transformations as one idea was discarded in favour of another more workable one. Originally she was to be an "egg-timer" hourglass but the turned supports were beyond me - hence the hourglass insert on a padded based. The 1890's fringe was intended to be frizzier but the damp winter foiled me...some day I will find the perfect hair but not this time!